I have always loved eating in great restaurants, and have been very lucky to do art work for some of my favorites. I suffer from a type of culinary synaesthesia, which causes me to experience the sensation of taste vividly as swirling images and colors. In this section of Chasworld I will explore projects from various restaurants as well as murals and works displayed in public places. I will begin with the most recent, Canto degli Angeli, Song of the Angels, from Jojo Restaurant, in Pittsford, NY. Canto degli Angeli is a three panel painting measuring approx. 6 feet tall by 18 feet wide. 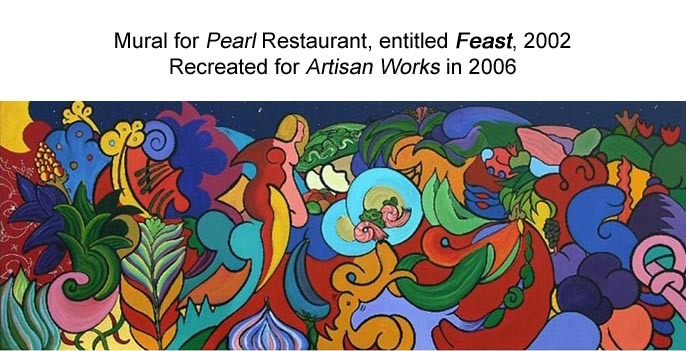 Installed in Jojo restaurant, 60 North Main St. in Pittsford, New York, in 2008, the painting explores the evolution of life along the Erie Canal, which is a few hundred feet away from the restaurant. Jojo is a fantastic place to eat-visit them on the web at www.restaurantjojo.com . Prints of the painting, pictured below, are available for $375 (image size15 inches by 45 inches) and may be purchased from the Catalog in the Giclee Print category. Canto degli Angeli, 2008, acrylic on canvas, 6' x 18'. 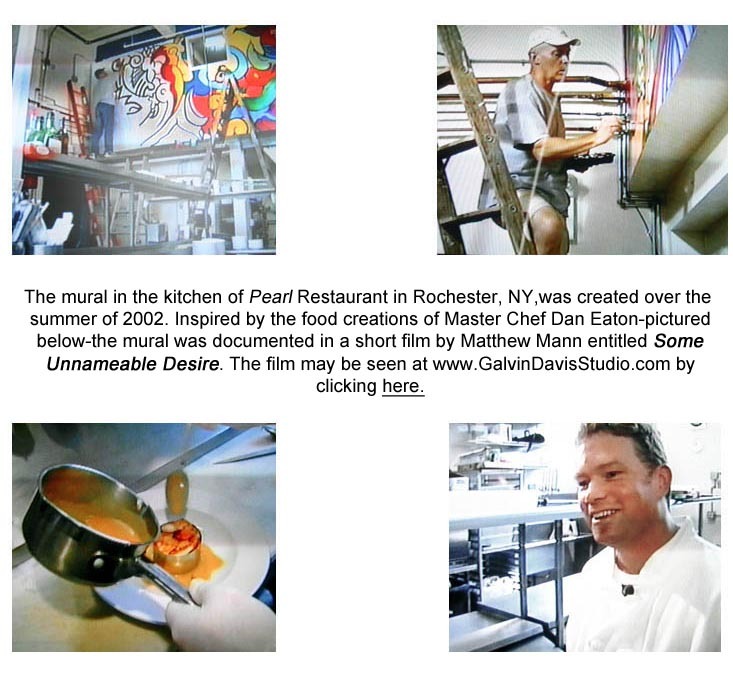 In 2001 Pearl restaurant opened in the same building as Galvin/Davis Studio. The kitchen was only a few steps from the back door of the studio, and it was there I met Dan Eaton, the Chef of Pearl. Dan had an empty space 8 feet by 25 feet high up on the kitchen wall, and I eventually started filling that space with paintings inspired by Dan's creations. Signed and numbered prints are available, 12" x 36" image size, for $375 on the Catalog page in the Giclee Print section. The print is also available framed museum quality in a black wooden frame with plexiglass for shipping or glass for deliveries. The framed price is $575, plus shipping and delivery. As always, if i deliver it, I will help you hang it too. The test painting for the mural is also available in the Painting on Canvas section of the Catalog. It measures 2' x 6' and is acrylic on canvas.